The Walt Disney Company on Thursday revealed the first look at its coming direct-to-consumer streaming service Disney+. 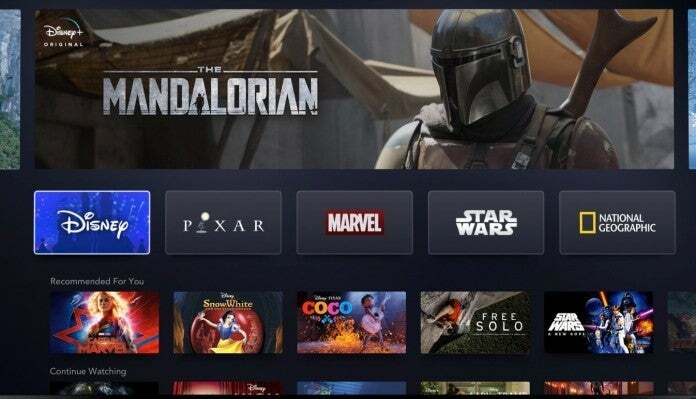 The unveiled prototype app highlights themed, animated tiles categorizing Disney, Pixar, Marvel, Star Wars, and National Geographic, each home to Disney’s thousands of films and television shows from across its many brands, including Disney+ exclusive series Falcon & Winter Soldier, Monsters at Work, and High School Musical: The Musical: The Series. “The hero carousel at the top of the page enables us to feature what’s new and noteworthy, while allowing easy access to the content consumers want to see,” explained Kevin Mayer, Chairman, Direct-to-Consumer and International. Each tile will “showcase the very best of that particular brand,” offering permanent homes for the Walt Disney Animation Studios canon and selections from the Marvel Studios, Pixar Animation Studios, and Star Wars filmographies. When selected, each title displays a personalized landing page, featuring a synopsis, cast, trailers, extras, and behind-the-scenes footage, as well as options to add a selected title to a watchlist. When applicable, some titles, including Captain Marvel and Avengers: Endgame, will be available for viewing in the premium 4K Ultra HD format. Disney+ launches later this year.